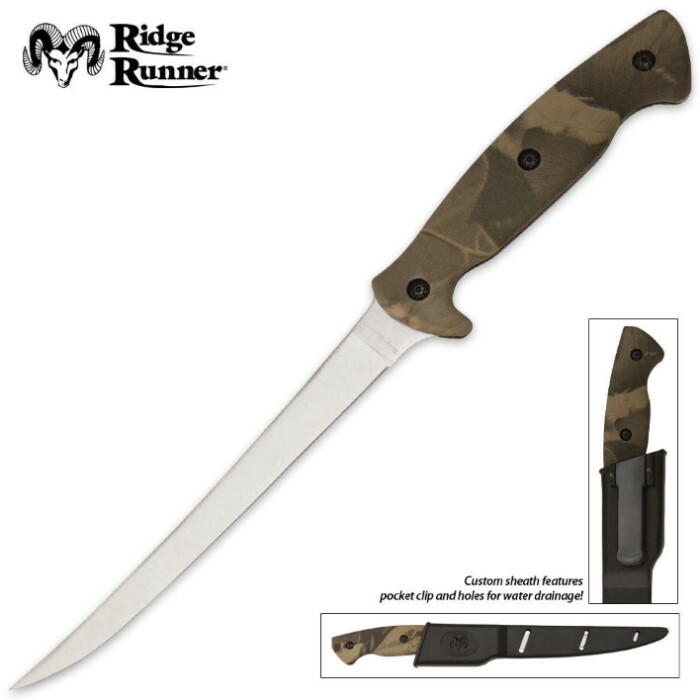 Ridge Runner Master Camo Fillet Knife | BUDK.com - Knives & Swords At The Lowest Prices! i got 2 off these knives to try boy was i suprised this knife is great. the handle fit nice in my hand. even comes with sheath. nothing bad to say about this knife.it is great i love it and just ordered 5 more. thank u b u d k.
Great knife, gives my rapla a run for the money! Been Fishing norther Wisconsin for years, and never had a knife as good as this one. Can't wait to fillet some wallies! This is an awesome filet knife! I use this knife at least 4/5 times a week, it never lets me down. On occasion I give it a quick sharpen which it takes easy. The hard sheath is great, no cutting thru a nylon one. Purchased several, purchasing several more. Don't pass this up you will not be disappointed. Tks again BUDK! I ordered this fillet knife to put in my fishing tackle box and for the price I wasn't expecting much. I was wrong! This fillet knife was of good quality, sharp and well built. The plastic sheath will last a lifetime and comes with a spring-loaded belt clip which makes it handy to have near at hand. The sheath also has water drain slots which is a plus. For your hard earned money, you can't lose on this deal, I am ordering more for Christmas gifts. They will think I spent a lot more money on them than I actually did. No, I am not cheap, I'm thrifty and wise. i bought this knife not knowing what i was getting myself into. this fillet knife is one of the best i have ever had buy far. i thought it was going to be a cheap knife because of the price. it was really sharp when i got it. really nice water proof case. Editor's Note: Thank you for your comments. We have updated the review to reflect the appropriate spelling.